Bellotto’s “The Zwinger Complex in Dresden” is part of the Kimbell’s new exhibit. During the reigns of three successive kings named Augustus in the 18th century, the city of Dresden became a haven for culture and Baroque architecture. Buildings such as the Japanese Palace, the Pillnitz Castle, and the Taschenbergpalais gave the city one of the most distinctive skylines in Europe and earned it the nickname “The Jewel Box.” Despite the World War II bombing by British and American forces that destroyed many historic structures, the city has emerged from behind the Iron Curtain to resume its place as a center of German culture. Now, a few days before the anniversary of those bombings, the Kimbell opens its new exhibition, The Lure of Dresden: Bellotto at the Court of Saxony. Bernardo Bellotto, a nephew and student of Canaletto, was an Italian cityscape painter who emulated his uncle’s shatteringly clear landscapes of Venice. Bellotto moved to Dresden in 1747 at the request of King Augustus III and captured the city in its pomp, possibly using a camera obscura to help him render Dresden’s architectural splendors in such fine detail. 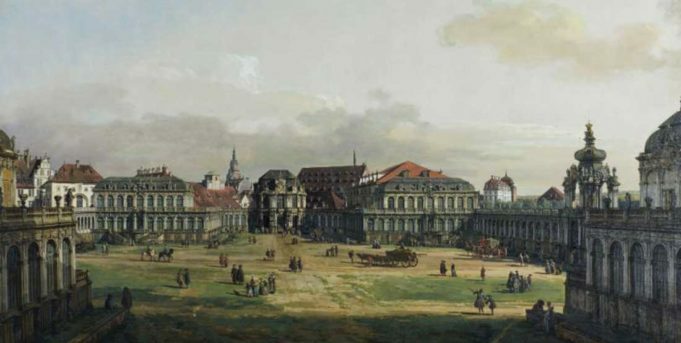 More than just pieces of art, these are historical documents that have guided the urban planners of Dresden as they have worked to restore and rebuild their city. These treasures have been kept in this city on the Elbe River, but thanks to a generous loan, you can see them here.